What skill do struggling readers need the most? I purposefully tried to trick you with this question. In my expert opinion, after working with struggling readers for 16+ years, the answer is (e) none of the above. Are you surprised? If it’s not the skills listed above, then what are struggling readers missing? The answer to that question is the topic of the post. Are you curious? I hope so. If you are, keep reading! When I first got my job teaching reading exclusively, I actually didn’t know how to teach reading. Apologies to the boss who hired me at the time! I knew how to help a student learn to read better, but I had no clue how to turn a non-reader into a literate one. Luckily for my students’ sake, I learned quickly. My first year working an as Early Intervention Program (EIP) teacher, I was assigned a variety of grade level segments, all the way from Kindergarten to fifth grade. In fact, at one point in the day, I had to leave my Kindergarten reading groups and roll my resource cart over to the fifth grade department and work with students 5-6 years older during the next hour. It was difficult to switch my conversational and teaching style during the walk in between the halls, and sometimes I made the mistake of speaking in my “little kid” voice to the “big kids”. That difficulty aside, though, having those teaching segments next to each other was the turning point in me learning how to teach someone how to read. I had to test the Kindergarten students on some critical skills in their grade level standards, specifically segmenting sounds and blending nonsense words. After I assessed the Kindergarten students, I assessed my fifth graders as well, just as an experiment. The result was a moment of awakening! The fifth graders who couldn’t read could not do those Kindergarten skills. They could not tell me the first sound in a word or break apart a word into beginning, middle, and ending sounds. This affected their ability to spell words. (Newsflash-they were terrible at spelling; their letter choices made no sense). They also couldn’t put sounds together, either orally or when looking at written words. Therefore, they couldn’t sound out words when they were reading. Put these two skills together (blending and segmenting) and you get alphabetic principle/sound symbol correspondence. That’s what the students were missing: the understanding that letters stand for sounds and you put these sounds together to read (blending) and take them apart to spell (segmenting). 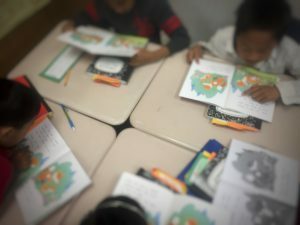 I started using the same activities in both my Kindergarten groups and my fifth grade groups, and voila- the students learned to read! Once the fifth graders mastered blending and segmenting, I was able to accelerate their progress and teach all the other sounds and word knowledge they needed. So, try it-I dare you. Take a struggling reader of any age and rewind the curriculum clock back to Kindergarten. Test them on blending and segmenting and see if they can do it. If they cannot, and in my experience 9.5 times out of 10 that’s true, then you have your starting point. Work on phonemic awareness with them-the older they are, the quicker they’ll pick it up. And they’ll be so happy and comfortable working on something they can actually do! The phonemic awareness activities will seem easy and fun for the students; they won’t feel “babyish”, I promise. So, to recap: What skill do struggling readers need the most? Correct answer: (d). Test for, and then teach blending and segmenting. Then you can fill in the rest of the gaps in their reading development.